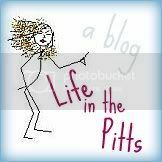 Life in the Pitts: "Anything that smells better than my armpits." We left the airport, and headed to my Dad's house. Exhausted. "Bad news, we have to stop." He looked over, irritated. "Can't it wait?" "Well, probably. I mean, I haven't worn deoderant in 3 days, so what's a few more?" Horrified, he crossed 3 lanes, and pulled over immediately, into the grocery store parking lot. I elected to stay in the car with the sleeping baby (as her food source, I am the first line of defense against grumpiness). "What kind should I get you?" I'm pretty sure he puked a little in his mouth.